18 Candles. 18 Roses. 18 Treasures. 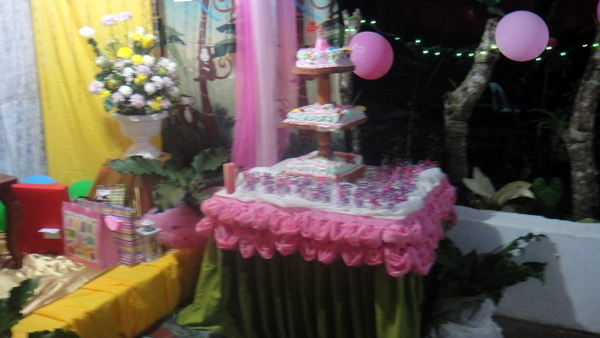 My wife and I had been invited to the 18th Birthday celebration for Cousin Emma’s daughter, Kristine Ann. But when I saw the invitation and my name listed under the “18 Treasures” category, I asked my wife what was going on. This did not look the usual birthday bash in the Philippines. Indeed, it wasn’t. 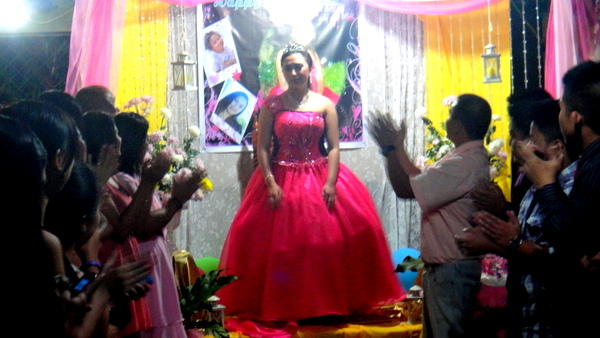 Kristine Ann, at age 18, was now a debutante, a young woman making her formal entrance into society. This event was in fact, a Debutante Ball. I had seen Sunday society pages back in Illinois which would occasionally feature “Debutante’s.” Having two brothers and no sisters, in addition to being a proud South Central Illinois redneck, I never had to attend such an event. I hadn’t realized some people in the Philippines also followed this tradition. Back to the “treasures.” What exactly was my role? I was enlightened by my asawa: I would have to present a gift to the debutante and make a brief speech. San Miguel Vice Mayor Ruben Corpuz headed the “18 Treasures” list along with two engineers, a doctor and a teacher. Looks like I was in good company. I really wasn’t feeling sociable and didn’t really want to go to the event. I had used up my limited people skills during an expat meeting at The Shirven Hotel in Guimaras the previous evening. But my wife informed me we would be attending. Case closed. Danit, Kristine Ann’s gregarious tatay (father) brought me a bottle of warm Red Horse beer upon our arrival at the party but I planned to severely limit my consumption of any alcoholic beverages. At a previous celebration at Danit and Cousin Emma’s joint, I had downed eight bottles of the strong Filipino brew, way over my limit. My asawa had already told me three or four beers would be enough. I listen to my wife. Occasionally. 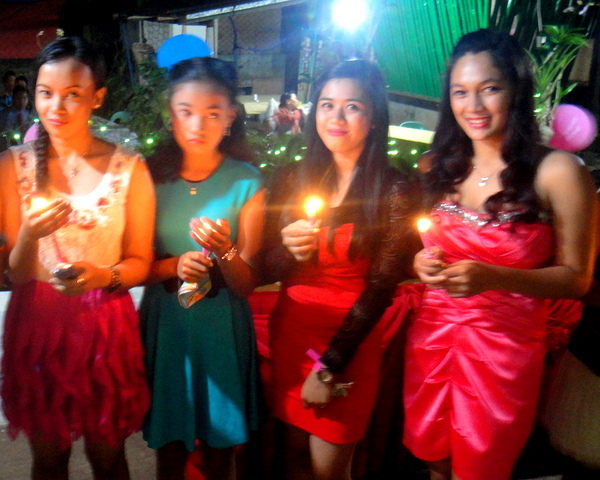 Our niece Michelle was listed on the program as one of those young Filipina beauties that would light a candle, approach the new debutante, make a wish and vocalize it to Kristine Ann. But for some reason our 13-year-old niece DinDin, substituted for her cousin Michelle. I asked why. Michelle’s dress did not fit her. I didn’t pursue the matter any further. 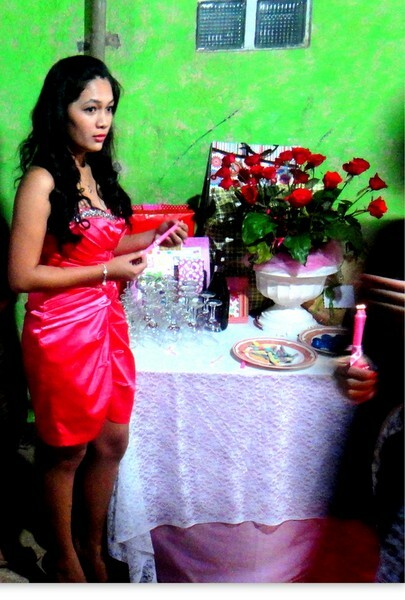 One of the pretty pinays that presented candles. Our niece DinDin is shown on the far right. The strong breeze that night snuffed out many of the candles and they had to be relight them. 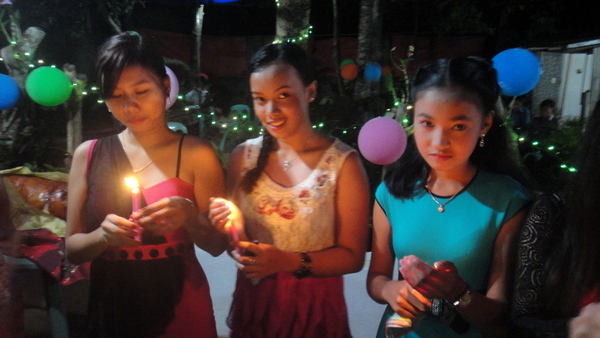 Niece DinDin and other attractive Filipinas with their candles. 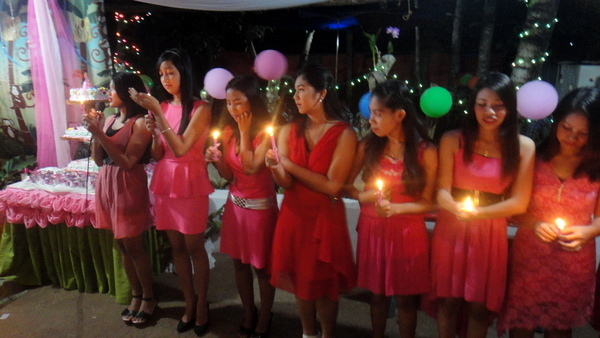 After the pretty pinays presented their candles, the “18 Treasures” on hand were up. The Vice Mayor gamely was up first and delivered a brilliant soliloquy. After a few more speakers, it was my turn. I had only consumed one bottle of Red Horse at this point and again, wasn’t in the most genial mood. I gave Kristine Ann a card (which had a P500 note enclosed) and told her she had already had the two greatest treasures a person could have: a mother and father who loved her. Corny, but that’s all I could come up with. The “18 Roses” part of the ceremony was next. I was getting hungry. It was approaching 8:30 pm. My heart sunk when I heard the emcee announce that the roses would be presented by 18 Filipino bachelors who would then dance one or two minutes with Kristine Ann. 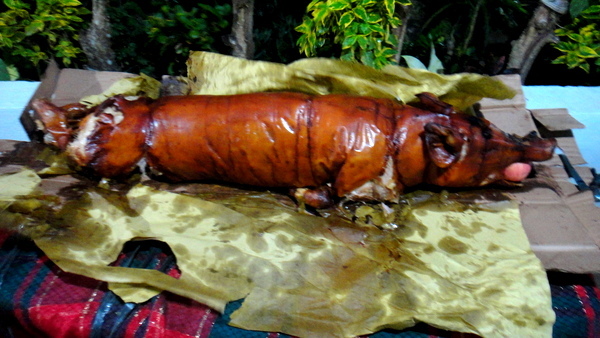 My stomach was growling as I continued to longingly eye the roasted lechon on a table only a few meters from me. Finally, after 9 pm and what seemed an exceptionally long blessing for the food, the lechon was served. Danit had given me a second bottle of Red Horse. I waited for others to get their meal, though I was hungry. My loving asawa gave me a hunk of her roasted pig to tide me over. I polished off my second bottle of beer, and got a plate of lechon and birthday cake. Danit had handed me another Red Horse that I set underneath my plastic chair. That’s when disaster struck! 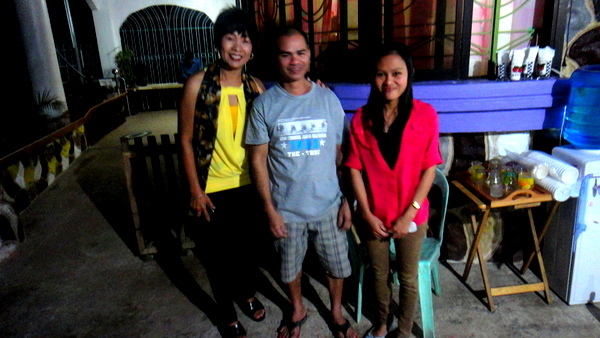 One of my wife’s legions of relatives on Guimaras, a cousin, pictured below with his girlfriend from Iloilo on his right, and my asawa on the left, began moving chairs for some inexplicable reason, and dumped over my bottle of beer! He quickly apologized. I asked my wife to text our trike driver “NoNo” to take us up. I didn’t want our driver to have to stay up all night waiting for us. And, after, all, my beer was gone. Not much reason to stay anymore. I wasn’t going to wait for the disco dance that was held later. I’m a 62-year-old geezer in the Philippines. My idea of staying up late is surrendering to The Sandman at 9 pm. And that’s on a good night. “NoNo” quickly arrived and took us back to “The Farm.” I promptly dozed off. I could now scratch off “Attending a Debutante Ball” from my Bucket List.